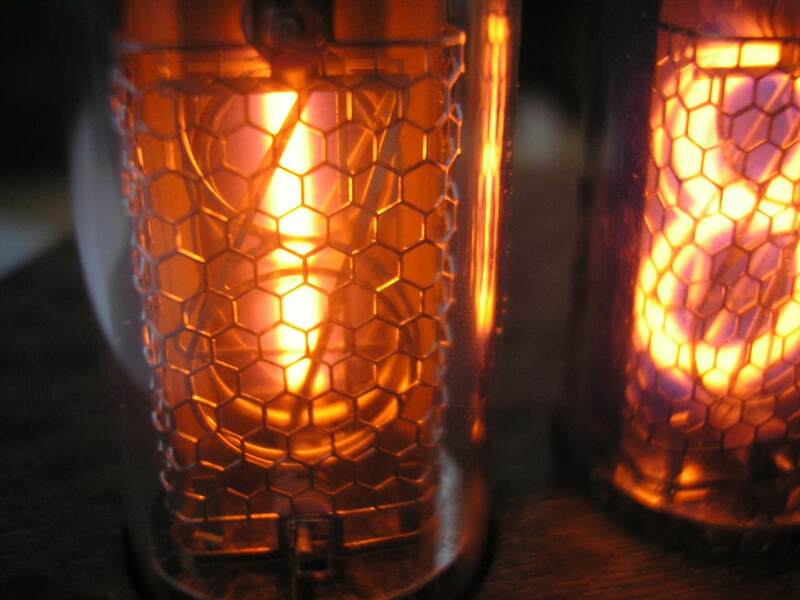 Nixie tubes are neon filled glass tubes. There are 10 metal cathodes in each tube, each one shaped like a different number. There is also a metal grid surrounding the cathodes. When a high voltage is applied between the metal grid and one of the cathodes, electrons will ionize the neon gas around the cathode, and cause it to glow. This is how the numbers are lit. Although the voltage is high, the amount of current flowing is very small, so the clocks do not use much power. They only consume about 3 to 4 Watts of power, and consequently generate almost no heat. The tubes are not hot or even warm to the touch. Please see this excellent article on Wikipedia about nixie tubes. 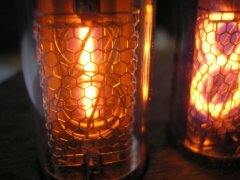 What are "IN-12" and "IN-14" Nixie tubes? These are both nixie tubes made in the former Soviet Union. They are the same inside, but the IN-14 tubes stick out the top of the clock, and the IN-12 tubes are made to stick out the front. I sell IN12 clocks in 4 tube kits and models, to display the hours and minutes in standard 12 hour time, and in a 6 tube verision, to display hours, minutes, and seconds. All of the IN14 clocks have six tubes. Additionally, the 6 tube clocks of both types can be set to show 12 or 24 hour (military) time. Do any of the clocks have an alarm? No, none of these clocks have an alarm. The design is a simple desk clock, literally without any bells or whistles. Can I use the IN-12 clocks outside of the US or Canada? Generally, no. The IN-12 clocks require 120V, 60Hz power. Many countries have 240V, which will cause the fuse to blow on the clocks. Even with a step-down transformer, many countries use 50Hz power, which will cause the clock to keep time inaccurately. Only countries with 120V, 60Hz power can use the IN-12 clocks. If your country has 120V 60Hz power, please e-mail me to arrange shipment outside of the US. Can I use the IN-14 clocks outside of the US or Canada? How long do the tubes last? Is there a warranty? The IN-12 and IN-14 tubes do not have a manufacturer "Mean-Time-To-Failure" rating. I have heard of these tubes lasting as long as 20 or more years, but it is more realistic to expect about five years from a clock before a tube fails. I do guarantee the tubes for 30 days - just send the clock to me and I will replace the defective tube for free. For damaged tubes, and defective tubes after 30 days, there is a $30 charge for replacing the tube ($20 per additional tube if more than one are broken). For other clock problems (not nixie tube related), I warrantee the clock parts and labor for 1 year. How can the tubes be replaced? The tubes are soldered in, so replacing them requires some soldering/unsoldering skill. If you don't want to tackle it yourself, a TV/Electronics repair shop should be able to do this. You can also send the clock to me and I can replace a defective or damaged tube. Do you sell spare tubes? I do sell spare tubes with the purchase of a clock. Spare nixies are $20 each. You can use this link to add a spare tube to your order. Spare tubes are only offered with the purchase of a clock or kit, or for those who have previously purchased a clock or kit. The IN-14 clocks use a crystal oscillator to keep track of time. The default accuracy of the oscillator is 20 parts per million (0.002%). However, the error in the oscillator is mostly a constant offset (i.e., the clock always runs a little fast or slow by less than a minute per month). The software in the clock can be calibrated to account for this offset. The result is a clock which is much more accurate then 20 parts per million. Since the offset is different for each clock, the calibration procedure is an optional task which you can perform. The procedure involves setting the clock, waiting a few days, weeks, or more, and then checking how slow or fast the clock has become. You can then calculate an adjustment factor, and enter this value into the clock by using the buttons (see instructions). You can use www.time.gov in the U.S. for a time reference. Alternatively, here is a table of time adjustment factors based on a 1 day, 3 day or 10 day time test. The original spreadsheet can be downloaded here. Please click here for a copy of the kit assembly instructions for the 4 tube IN-12 clocks. Please click here for a copy of the kit assembly instructions for the IN-14 clocks. Please click here for a PDF with a 1:1 scale drawing/template of the IN-14 circuit board for those who are building their own enclosure.